One of the favorite foods of many is a good old fashioned hot dog. But, there is a knack for being able to cook these, so they taste their best. There are different ways to cook these like boiling them, barbecuing, microwaving or even frying. All these methods work, but if you really want the ultimate tasting hot dog, then you may also want the Large Coca Cola Hot Dog Steamer. 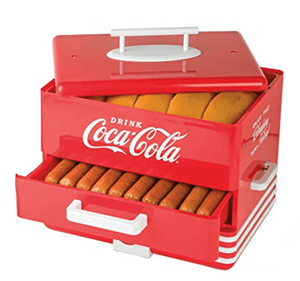 The Large Coca Cola Hot Dog Steamer can steam two dozen wieners at one time along with twelve buns. Then when one batch of hot dogs is being enjoyed, you can heat the next batch of buns. The unit has three settings which are off, warm and high. In addition to wieners, you can steam brats and sausages and use beer or other beverages to steam infuse some great tastes. It can also be used for steaming other types of food. The claims being made about the Large Coca Cola Hot Dog Steamer is that it is quality made and is convenient. Very little mess to clean up as it is easy to take apart for cleaning. This really is a great way for being able to cook up a large batch of hot dogs that taste just like the ones you would get at a sports stadium. The hype for the Large Coca Cola Hot Dog Steamer is that it is so convenient and steaming really is a great way to retain the flavor of foods including hot dogs. The cost for the Large Coca Cola Hot Dog Steamer is $39.45.depending on where you buy it. The commitment for the Large Coca Cola Hot Dog Steamer comes more when you are ready to clean the unit. Which is not any more difficult than cleaning the other items you would need for cooking hot dogs. We really like the idea of the Large Coca Cola Hot Dog Steamer. It is reasonably priced, and it appears that a lot of other people like it as well. Currently, it has 328 reviews giving it a 4.5-star rating. With 76% of these rating it five stars. It is receiving good ratings on being easy to use, easy to clean and durability. We are going to give the Large Coca Cola Hot Dog Steamer a thumbs up. It is a great way to cook using steam and to heat the buns at the same time. Steaming brings the best out in food, and that is what everyone expects when it comes to a good hot dog. It is convenient and reasonably priced. There are other types of hot dog units on the market. Some of these will actually toast the buns, but the main complaint of many of these is the unit doesn’t handle a standard hot dog bun properly. If steaming is not for you and you prefer grilling your hot dogs as well as other food as an alternative to barbecuing, then you may want to check out our electric grill reviews. Does the Turbo Roaster Really Work? Does Squeezy Freezy Really Work?